The record turnout from young voters during the 2018 midterms has candidates trying to win them over as they hit the campaign trail for the 2020 presidential election. NBC10's Lauren Mayk explains the impact that younger voters could have on the race for the White House. 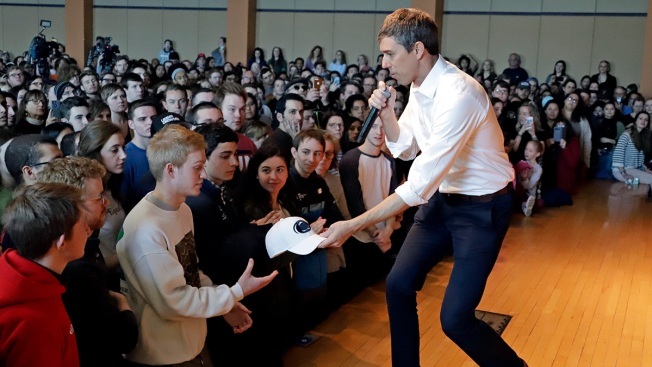 Beto O'Rourke's splashy campaign event in Pennsylvania last week appeared to herald the start of the state's presidential primary season. It also occupies a unique place in the minds of Democrats. It flipped to Republican Donald Trump — by less than 1 percentage point — in the 2016 election after backing Democrats in six straight presidential elections. Many in 2016 declared their support for Clinton even before primary votes. Now, Pennsylvania's Democratic Party chairwoman, Nancy Mills, said she asked the state's national party members to remain neutral until the convention. Perhaps 1984 was the last, most impactful Democratic primary election in Pennsylvania, said Terry Madonna, a pollster and public affairs professor at Franklin and Marshall College in Lancaster. That's when Walter Mondale, Gary Hart and Jesse Jackson came to Pennsylvania. Former Vice President Joe Biden, if he runs, has a built-in advantage in Pennsylvania, many say. He has close ties to longtime party officials and is a fixture on Pennsylvania's campaign trail, including stumping in November for Gov. Tom Wolf and U.S. Sen. Bob Casey.